Dr. Romano is a professor of political science at Missouri State University in Springfield. In Turkish political circles, there is a popular quip: "The United States wanted Turkey and Iraq's Kurds to become friends, not get married. "1 As their cooperation deepens, especially in hydrocarbons, observers increasingly question whether the relationship will endure. A solid strategic relationship is born of shared national interests, mutual respect and real interdependence. Fleeting cooperation, in contrast, stems from a temporary confluence of political interests, typically dependent on the personalities and preferences of leaders who may fall from power in the foreseeable future. Such cooperation can fulfill pressing needs, but both parties know the arrangement will be discarded in short order. Have Ankara and Erbil become real partners? For a variety of reasons, the relationship between the two likely represents an emergent strategic alliance more than a temporary marriage. Shared national interests appear particularly strong, while mutual respect and interdependence have been growing. Many longtime observers of Turkey have difficulty coming to terms with such a shift. Since its founding in 1923, the Turkish Republic could always be depended upon to oppose anything Kurdish anywhere in the world. When the United States first overthrew Saddam Hussein's regime in 2003, Turkey worried most about how this might facilitate Kurdish secession from Iraq. However, the nature of Turkey and its priorities and views of the Kurds have changed since Recep Tayyip Erdogan's Justice and Development Party (Adalet ve Kalkinma Partisi,AKP) came to power in 2002. The "deep state" traditionally refers to a network that existed prior to 2007 among the military and other non-elected sectors of the government, in particular, their exercise of unofficial veto power over key policies. This network formed a subset of the "Kemalist" establishment: Turkey's Westernized socioeconomic and political elites, who shared a veneration of the republic's founder, Mustafa Kemal Ataturk, and his principles. The most dedicated Kemalists held strong convictions and even obsessive views about upholding Turkish nationalism and secularism. They saw anything remotely identified with Islamism or Kurdish nationalism as mortal threats to the Turkish state. Accordingly, they exercised their unofficial powers (the deep state, as opposed to the public, superficial state) to stage military coups against governments displaying questionable loyalty to Kemalist principles, overturning democratically elected governments in 1960, 1971, 1980 and 1997. The deep state likewise prevented civilian Turks from recognizing the country's Kurdish minority or getting too friendly with Kurdish actors in neighboring states. It was this same Kemalist elite and the subset of Kemalists of the deep state who set the parameters for pre-2007 Turkish foreign policy. The Kemalists viewed the Iraqi Kurds as a threat to be contained and suppressed. They refused to recognize Kurdish autonomy in Iraqi Kurdistan or deal with the Kurdistan Regional Government (KRG) of Iraq in any high-level capacity. Their main priorities were containing the Kurdistan Workers' Party (the PKK, Kurdish rebels from Turkey who were based in the rugged mountains of Iraqi Kurdistan) and preventing a Kurdish state from emerging. Turkey began to change dramatically with the 2002 election of Erdogan's mildly Islamist AKP, however. The AKP sees Kurds more as fellow Muslims than implacable threats to the Turkish nation. Thanks to a change in the electoral rules in Turkey, Erdogan's new AKP managed to win a majority government in 2002 with only 34.28 percent of the popular vote. They used their majority government to push through liberalization of the Turkish economy, attract foreign investment and steer Turkey towards a rate of economic growth it had not seen in years. As a result, the AKP won ever-increasing shares of the popular vote in subsequent elections. After some 10 years in office, Prime Minister Erdogan was elected president in 2014, becoming Turkey's first directly elected president and intending to turn a largely ceremonial office into a much more powerful one. This is the same Erdogan who was imprisoned by the Kemalist establishment in the late 1990s (while he was a Refah party member and mayor of Istanbul) for reading an "Islamist poem" at a political rally. 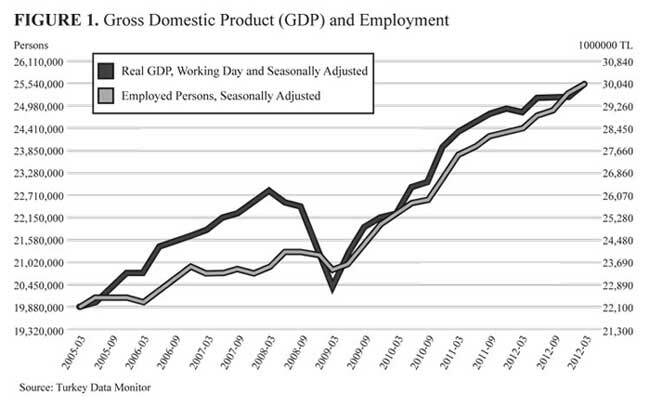 The employment and economic-growth data in Figure 1 provide the key to AKP electoral success in Turkey. During the 2002 period of AKP rule in Turkey, however, the deep state still played a dominant but slowly declining role in foreign and security policy. Prime Minister Erdogan and his party remained fearful of a military coup (several predecessor parties of the AKP had been overthrown by the military or banned by the Turkish Supreme Court). As a result, policy towards the Iraqi Kurds during this period appeared only marginally friendlier than it was prior to 2002. The military almost removed Erdogan's government from power in 2007. The generals at the time threatened a coup if the AKP did not remove its candidate for president, Abdullah Gul. Erdogan responded by calling a snap election to renew his political mandate, which he handily won. The vote was viewed as a popular referendum between the AKP and the military. Gul was duly appointed president, and the military began its retreat to the barracks. At the same time, the AKP government moved to arrest increasing numbers of Kemalists in the military and other sectors of government and society in what is known as the "Ergenekon Investigations." The government used the opportunity to draw up an ever-longer list of its Kemalist enemies and go after them, inventing evidence when it could not be found.2 Thousands of military officers and other elites were imprisoned, including the former chief of staff of the armed forces. The heads of the army, navy, air force and gendarmerie all resigned.3 Judges, journalists, public officials and others critical of the AKP were removed from power and replaced by AKP supporters. In less than 10 years, Prime Minister Erdogan managed to defang the military and dismantle the deep state. The changes were nothing short of revolutionary and allowed for a complete reorientation of domestic and foreign policy. Just because the Turkish government after 2007 became free to pursue a new policy towards the Kurds does not explain why it chose to pursue close ties with the KRG, however. To understand this, one must look at Turkey's energy needs and economic opportunities in Iraqi Kurdistan, as well as the common perception that the AKP must continue growing the Turkish economy if it wishes to keep winning elections (especially after the Gezi Park protests that roiled the country in the summer of 2013 and the corruption scandal of December that year7). The graph below shows Turkish gas imports for 2011, of which 19 percent came from Iran and 58 percent from Russia, sold to Turkey at relatively high prices. Turkish crude imports in 2011, of which 51 percent came from Iran, 17 percent from Iraq and 12 percent from Russia, betrayed a similar dependence on hydrocarbons from states with which Ankara has increasingly difficult relationships. Even if Turkey were not being asked to stop importing from Iran, its dependence on Russia and its present level of consumption, near maximum import capacity, are a problem, as is true for Europe. Economic growth and rising gas consumption pose serious problems for Turkey's future. 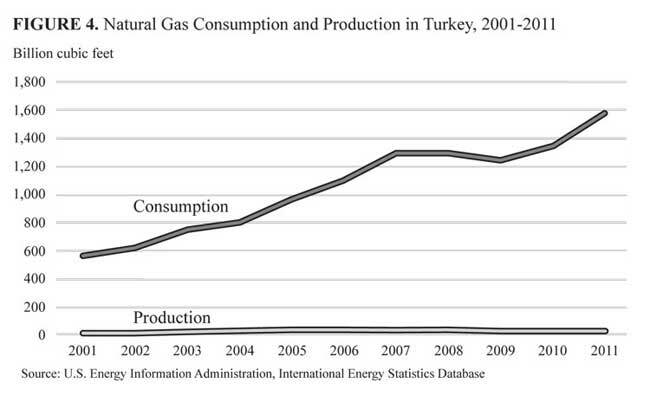 Figure 4 shows Turkey's recent gas consumption relative to domestic production. Given stagnant domestic production of natural gas in Turkey, rising imports must meet the rise in consumption, especially since Turkey uses most of its natural gas to run electric-power stations, without which its economy would grind to a halt. Natural-gas infrastructure is expensive, and import pipelines take a long time to build. Expanding import capacity requires a source that is as close as possible lest the costs quickly become prohibitive. 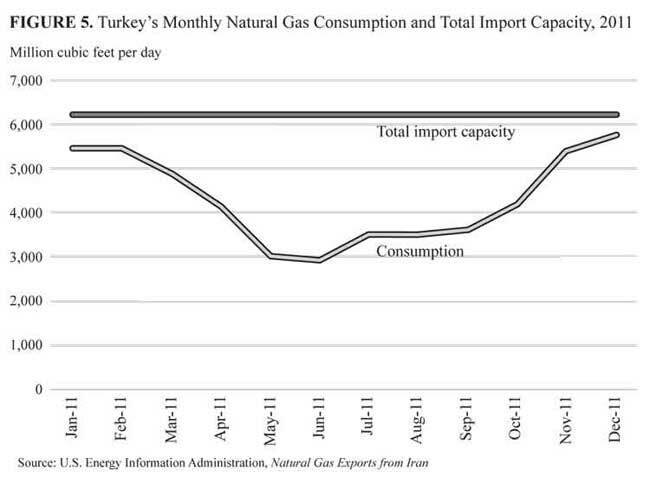 Turkey by 2011 was near its ceiling of existing gas-import capacity, however. This was the situation for policy makers in Ankara at the moment when high economic growth, to which they attribute their electoral success, threatened to quickly surpass available energy sources. If the trend of the past 10 years continues at even half the pace for the next 10, Turkey will face pressing energy needs and have a particularly serious natural-gas shortage on its hands (this conservative estimate assumes continued Iranian and Russian gas supplies). An energy shortage would cause serious price hikes and economic slowdowns, which would seriously hurt the current AKP government's chances for reelection. In such a context, Ankara's solution has been to look to its southeastern neighbor, the Kurdistan Region of Iraq, which has a lot of oil and gas capable of being produced, transported and sold much more cheaply than any competing source.10 With the deep state defanged, the Erdogan government after 2007 also felt confident enough to begin doing whatever it wanted, whether ending the partial ban on head scarves, wrecking relations with Israel, negotiating with the PKK or placing Ankara's relations with Baghdad at risk by pursuing close strategic ties with Erbil. The ambassador's reference to "undermining efforts to achieve agreement on national hydrocarbons legislation in Iraq" refers to an American belief at the time that the Iraqi Kurds should allow the central government in Baghdad to control the hydrocarbons industry and all oil and gas exports from Iraq. By pursuing deals with the Iraqi Kurds against Baghdad's wishes, Turkey effectively lessened the pressure on Erbil to cede control of these issues to the Maliki government.12 Turkey's stance at the time displeased and surprised Washington. The attraction of oil and gas resources in neighboring Iraqi Kurdistan was simply too good for Ankara to pass up or even jeopardize, however. KRG Minister of Natural Resources Ashti Hawrami summarized part of the thinking involved: "Nowhere in the world does 1m barrels a day (of crude-oil production capacity) remain stranded forever. "13 Such levels of hydrocarbon resources, located near very energy-hungry states, find ways to overcome whatever political hurdles arise. Rudaw: A new deal on the exploration and export of Kurdish oil has been signed between Ankara and Erbil. What are the contents of that deal? The unstated subtext was that, should Baghdad and Erbil fail to reach agreement on hydrocarbons policy, Turkey would go ahead and deal with Erbil — while using vague elements of the Iraqi Constitution to claim that Ankara is not violating anything. In addition to fulfilling its needs with Iraqi Kurdish gas, Turkey also hoped (and still hopes) to leverage its position to great advantage. According to Middle East Oil and Gas Monitor, "Turkey offers the best route to market for Iraq's gas reserves, as well as for those of the Caspian, Iran and the newly discovered reserves in the East Mediterranean. Leveraging its potential as a transit route is expected to allow Turkey to meet its own gas needs at significantly below global market prices, allowing it to continue its rapid economic expansion." Erbil needs Turkey as an independent outlet for Iraqi Kurdish hydrocarbons. Syria, Jordan or Lebanon were never promising options, for an array of reasons ranging from civil conflict to geography. Since 2003, KRG leaders therefore worked hard to win Ankara's trust and good will. They avoided intervening in Turkey's Kurdish affairs and offered Turkish companies whatever extra incentives they could to invest in the region.16 This reflected a strategy of trying to protect themselves by fostering interdependence with Turkey. As their dispute with Baghdad over hydrocarbons authority escalated, they worked harder to cement energy deals with Ankara and Turkish energy firms. Kurdish leaders in Erbil do not fully trust Ankara, however, and a complete break from the government in Baghdad risks replacing one dependency with a new one. The ideal scenario for Erbil might be to secure Baghdad's recognition of the Kurdistan Region's right to manage its own hydrocarbons and their export, provided that the proceeds of the industry are shared with the rest of Iraq. This would allow Iraqi Kurdistan to steer a course between Ankara and Baghdad, turning to one if the other should prove more difficult. Ankara in turn prioritizes its access to hydrocarbons and investments in Iraqi Kurdistan, which dwarf Turkish investments in the rest of Iraq.17 If this can be done without overly empowering the Iraqi Kurds or facilitating their secession from Iraq and attainment of independent statehood, so much the better for Ankara. The Turkish preference against an independent Kurdish state does not, however, preclude the kind of hydrocarbons cooperation Turkey chose to pursue with the KRG. Many argue that by making energy deals with the Iraqi Kurds that bypass Baghdad, Turkey increases the likelihood of such an Iraqi Kurdish state emerging.18 But there is no automatic sequence leading from independent Kurdish oil and gas exports to the creation of a Kurdish state. Ankara (as well as Tehran and others) knows full well that even if the KRG manages to export hydrocarbons independently of Baghdad, as it appears to now be doing, there would still remain many good reasons for Kurdistan to stay in Iraq. Most crucially, Iraqi Kurdistan is landlocked and depends on the goodwill of at least one neighbor to access the rest of the world. Iraqi Kurds enjoying healthy revenues and more economic autonomy, in addition to their social, cultural and political autonomy, might be loath to risk it all in a bid for secession in an unfriendly neighborhood. This became more apparent after ISIS forces attacked Iraqi Kurdistan in August 2014. Even if Iraqi Kurds did use independent hydrocarbon exports to push for full independence, the new state would be dependent on Turkey (assuming it had bad relations with Baghdad). This eventuality would not represent the end of the world as Ankara knows it. Just as the Iraqi Kurds currently serve Turkish interests — helping to contain the PKK (see below), counterbalancing more serious competitors like Iran and the rest of Iraq, and providing desperately needed oil and gas — an independent state would probably do the same. Today's Ankara no longer sees the Kurds as the bogeyman it once did; Mr. Erdogan's AKP includes many Kurdish voters, and his party does not exhibit the kind of fear or ethnic chauvinism that used to be standard fare in Turkey. If the KRG would rather have the hydrocarbons tap turned off than surrender control of the region's resources to Baghdad (and this remains their position), then Turkey has to choose between its need for energy and its preference not to encourage South Kurdish statehood. Turkey has actually already made its choice, having taken numerous steps recently to import large quantities of oil and gas from the KRI. Economic interdependence can do much to foster peace and long-term good relations. It is not a panacea for every problem, however, and could itself be sacrificed on the altar of "high" politics: security concerns, nationalist drives for power and similar motives. In the case of Ankara's relationship with Erbil, however, there are good security and realpolitik concerns working in favor of close ties. First, the more trouble Ankara has with Turkey's Kurdish minority, the more it needs Iraqi Kurdish assistance. Turkey's counterinsurgency efforts since 1984 have failed to put an end to the PKK insurgency. However, the 2013 KRG-mediated peace plan led to the first-ever PKK agreement to withdraw its forces from Turkey;21 the militants withdrew into the KRI. Previous Turkish governments would not have considered asking for Iraqi Kurdish help on such an issue, much less negotiating with the PKK. The AKP government did both. The withdrawal announcement was historic, a first since the PKK insurgency began in 1984. The Iranian example is instructive. Iran pursued more cordial relations with the KRG and recognized Kurdish autonomy in Iraq from the beginning. It dealt directly with its leaders in top-level, official meetings. Iran was the first state to open consulates in the KRG (in 1988). Although a half-dozen Iranian-Kurdish rebel groups have bases in Iraqi Kurdistan, Iran from early on secured KRG cooperation in containing (but not eliminating) these groups and stopping them from staging attacks on Iran.25 When a new group called PJAK (the PKK-affiliated Free Life Party of Kurdistan) emerged in 2004 and launched a guerrilla war against Iran, it was Nechirvan Barzani of the KRG who eventually secured a ceasefire in 2011 (which is still largely holding).26 The lesson is clear: a dependent but friendly KRG is extremely useful for neighboring states with unresolved Kurdish problems. The AKP also needs to show the electorate that it can be both anti-PKK and a friend to the Kurds. In the elections since 2002, the AKP actually got more votes in the Kurdish regions of Turkey than the pro-Kurdish parties did.27 The Kurdish electorate in Turkey remains crucial for Prime Minister Erdogan's party. One of the best ways to win their votes without losing support from Turkish nationalists involves a three-pronged strategy: gradual democratic reforms to increase Kurdish rights in Turkey, a firm stance on the PKK (arresting and not releasing their leader, Abdullah Ocalan, from prison) and befriending the Iraqi Kurds as well as other Kurds not aligned with the PKK. Turkey, the KRG and the relations between them can tolerate a certain level of insurgent violence, should the PKK resume attacks in the future. After all, their relations began to blossom during years of fairly regular PKK attacks in Turkey. PKK assistance to Iraqi Kurds in the face of the August 2013 ISIS onslaught, followed by Iraqi-Kurdish assistance to PKK-linked Kurds defending Kobane in Syria (undertaken with Ankara's consent), greatly improved relations between the Kurdish groups, however. Nonetheless, few expect Erbil to sacrifice relations with Ankara by helping the PKK fight Turkey. Should the PKK eventually resume its armed struggle in Turkey, Erbil and Ankara will both seek ways to separate the issue from their own positive relations. Under such circumstances, Turkey would again need the KRG's help to deal with the problem. Despite improved relations due to the war against ISIS, the Kurds of the KRG (and the Barzani-led Kurdistan Democratic Party of Iraq, in particular) have no great love for the PKK guerrillas from Turkey. They have fought them in the past, and they are none too fond of their leftist revolutionary discourse or their adoration of Abdullah Ocalan. Even before the ISIS onslaught, however, KRG leaders remained unwilling to act against fellow Kurds militarily, recalling the low points of the 1990s. A new consensus in the KRG seems to have taken root, a shared refusal to let outside powers drag the Kurds into any more fratricidal wars. As a result, after the ISIS threat has passed — even if the peace process between Ankara and the PKK gets bogged down — the KRG will likely return to its policy of containing the PKK and leaving them up in their high mountain bases near the Turkish and Iranian borders. That would seem good enough for Ankara as long as the PKK doesn't kill too many people in Turkey. Such an arrangement could last for a long time. Besides the economic and PKK-related reasons for enduring relations between Ankara and Erbil, a final key factor needs to be mentioned: regional power politics. The principal sources of threat to Turkey have always been Russia and Iran, with lesser challengers occasionally emerging in Athens, Baghdad or Cairo. This was true even in pre-modern times, when the Ottomans faced off against Russian tsars, Safavid rivals and leaders in Cairo or Athens rebelling against the sultan. In contrast, even an independent South Kurdistan ("Bakur" in Kurdish, present Iraqi Kurdistan) would not enjoy a sufficient power base to compete with Turkey. It would more likely become its client. This seems even more probable given the Sunni-Shiite rift in the region. Turkey represents a leading Sunni power, and the Iraqi Kurds are overwhelmingly Sunni; Baghdad, Iran and Damascus are led by Shiites and enjoy strong Russian backing. What happened after these events speaks to an enduring Ankara-Erbil relationship, however. Despite accusations about ISIS and an apparent lack of Turkish military assistance to Erbil in its time of need, Iraqi Kurdish oil exports to Turkey increased, and new deals were announced.29 Faced with Kurdish unrest within Turkey, leaders in Ankara sought a way to mollify their Kurdish citizens without directly aiding the PKK-linked Syrian Kurds in Kobane, which might cause Turkish nationalist unrest. Their answer was to turn to the Iraqi Kurds, who sent 150 of their Peshmerga armed with heavy weapons to Kobane — via Turkey. Although one might reasonably suspect that the Turkish government was hoping the Peshmerga would not be enough to save Kobane (but just enough to stop Kurdish demonstrations in Ankara), by the start of 2015 the Kurds still held the town and appeared to be making significant gains there. Relations between Turkey and Iraqi Kurds easily passed the recent ISIS test. No ties are foolproof, however. A resumption of large-scale PKK attacks in Turkey, however unlikely, could trigger a popular Turkish demand for retaliation. This would undoubtedly harm relations, especially given that Erbil could not be expected to take any robust action against PKK militants operating from Iraqi Kurdistan. The population there overwhelmingly sympathizes with its Kurdish kin in Turkey. Iran also has an interest in preventing the KRG from getting too close to Turkey. Although the Iranians have the ability to make life difficult for the Iraqi Kurds — for instance, by closing their border or fomenting terrorist attacks within the Kurdistan Region — resorting to such coercive measures would constitute a major policy failure. Iraqi Kurds appear to be ignoring Iranian efforts to steer them away from Ankara. If the Iranians did resort to more coercive measures, Teheran would lose whatever current influence it enjoys over Kurdistan and push the KRG firmly into an opposing camp. The Iraqi Kurds could reciprocate by activating Iranian Kurdish opposition groups against Teheran; there are many based in the Iraqi Kurdistan region. The common struggle against ISIS and the improved relations between Erbil and Baghdad since Prime Minister Abadi replaced Maliki make such a scenario unlikely, in any case. It is difficult to envision a scenario that is both likely and able to derail the ties that have developed between Turkey and Iraqi Kurdistan. There simply exist too many imperatives pushing them together: economics, realpolitik and geography. All the hallmarks are present for an enduring relationship, at least for the next 20 years. 1 Massimo Morelli and Costantino Pischedda, "Let Turkey and Kurdistan Get Closer," National Interest, October 31, 2013. http://nationalinterest.org/commentary/let-turkey-kurdistan-get-closer-…. 2 For more on this, see Dexter Filkins, "The Deep State," New Yorker, March 12, 2012. 3 Alexander Christie Miller, "Turkey's Military Defanged: Is It Good for Democracy?" Christian Science Monitor, August 5, 2011, http://www.csmonitor.com/World/Middle-East/2011/0805/Turkey-s-military-…; and "Turkey: Military Chiefs Resign En Masse," BBC UK, July 29, 2011, http://www.bbc.co.uk/news/world-europe-14346325. 4 Humeyra Pamuk and Orhan Coskun, "Exclusive: Turkey, Iraqi Kurdistan Clinch Major Energy Pipeline Deals," Reuters, November 6, 2013, http://www.reuters.com/article/2013/11/06/us-turkey-iraq-kurdistan-idUS…. 5 Dorian Jones, "Turkey, Iraqi Kurdistan Seal 50-Year Energy Deal," Voice of America, June 5, 2014, http://www.voanews.com/content/turkey-iraqi-kurdistan-seal-50-year-ener…. 6 Cengiz Candar, "Erdogan-Barzani 'Diyarbakir Encounter' Milestone," Al-Monitor, November 20, 2013, http://www.al-monitor.com/pulse/originals/2013/11/erdogan-barzani-kurdi…. 7 Semih Idiz, "Gezi Anniversary a Reminder of Erdogan's Nine Lives," Al-Monitor, May 23, 2014, http://www.al-monitor.com/pulse/originals/2014/05/erdogan-survives-gezi…. 9 David O'Byrne, "Turkey — Leveraging its Location," Middle East Oil and Gas Monitor, November 19, 2013, 3. 10 According to a November 19, 2013 report, they already have: "KRG sources have suggested 10 bcm per year could be available by 2017." Quoted from David O'Byrne, "Turkey — Leveraging Its Location," Middle East Oil and Gas Monitor, November 19, 2013, 6. 11 Wikileaks, "Turkey: Input on Strategy to Integrate Iraq into Region," March 17, 2009, Cable from Ambassador James Jeffrey, https://search.wikileaks.org/plusd/cables/09ANKARA395_a.html. 12 For more on the Erbil-Baghdad dispute over hydrocarbons and the Constitution, see David Romano, "The Iraqi-Kurdish View on Federalism: Not Just for the Kurds," in Romano and Gurses, eds., Conflict, Democratization and the Kurds in the Middle East (Palgrave Macmillan, 2014). 13 David O'Byrne, "Kurdistan: Oil Pipeline to Turkey Is a Reality," Financial Times, November 1, 2013, http://blogs.ft.com/beyond-brics/2013/11/01/kurdistan-oil-pipeline-to-t…. 14 "Turkish Energy Minister: Turkey Cannot 'Sit Idly' over Kurdistan Energy Supplies," Rudaw, December 2, 2013, http://rudaw.net/mobile/english/interview/02122013. 15 Aydin Selcen, "Kurdistan Region of Iraq — A Friend to the North," Oil and Gas Year, 35. 16 The author was told this by numerous sources, none of whom wanted to be named or go on the record. KRG said that they intentionally offer Turkish companies better terms for investment and accept higher bid offers from them in order to increase Turkey's stake in the KRG. Private Turkish business interests in turn put pressure on leaders in Ankara to maintain a close relationship with the Iraqi Kurds. The strategy appears to be a success. 17 Some 70 percent of trade and investment between Turkey and Iraq is actually between Turkey and the Kurdistan Region of Iraq. 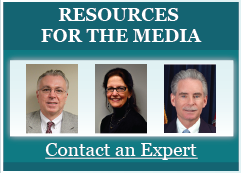 See Marina Ottaway and David Ottaway, "How the Kurds Got Their Way," Foreign Affairs, May/June 2014. 18 Salah Nasrawi, "A Step towards Independence," Al-Ahram Weekly, December 3, 2013, http://weekly.ahram.org.eg/News/4855/19/A-step-towards-independence.aspx. 19 Serkan Demirtas, "New Turkey, New Iraq in the Middle East," Hurriyet, July 9, 2014, http://www.hurriyetdailynews.com/new-turkey-new-iraq-in-new-middle-east…. Demirtas adds that "It's getting more obvious every day that the Turkish government's alliance with Iraqi Kurds and Turkish Kurds is becoming deeper and more diversified. This is a multifaceted alliance embracing Erdogan's ambitions of becoming Turkey's president and Masoud Barzani's ambitions of declaring independence, as well as capitalizing from lucrative business opportunities and deals." 20 "Turkey's AKP Spokesman: Iraq's Kurds Have Right to Decide Their Future," Rudaw, June 13, 2014, http://rudaw.net/english/kurdistan/130620142. See also "Celik Signals Turkey to Welcome Independent Kurdish State in Iraq," Today's Zaman, June 29, 2014, http://www.todayszaman.com/news-351625-celik-signals-turkey-to-welcome-…. 21 Sebnem Arsu, "Kurdish Rebel Group to Withdraw from Turkey," New York Times, April 25, 2013, http://www.nytimes.com/2013/04/26/world/europe/kurdish-rebel-group-to-w…. 22 Daniel Byman, "The Logic of Ethnic Terrorism," Studies in Conflict & Terrorism 21, no. 2 (April-June 1998):149-169. 23 David Romano, Brian Calfano and Robert Phelps, "Successful and Less Successful Interventions: Stabilizing Iraq and Afghanistan," International Studies Perspectives, November 11, 2013. 24 For a similar view about how Turkey needs the Kurds now that its "zero problems with neighbours" policy seems to have collapsed, see Marianna Charountaki, "Turkish Foreign Policy and the Kurdistan Regional Government," Perceptions 17, no. 4 (Winter 2012): 194-195. 25 David Romano, "Turkish and Iranian Efforts to Deter Kurdish Insurgent Attacks," in Andreas Wenger and Alex Wilner, Deterring Terrorism: Theory and Practice (Stanford University Press, 2012), 228-250. 26 "Iran and Kurdish Rebels Agree to Ceasefire," Al-Iraqi, (reposted from a Rudaw article which is no longer available online), September 28, 2011, http://www.aliraqi.org/forums/showthread.php?t=103601. 27 Berk Esen and Sinan Ciddi, "Turkey's 2011 Elections: An Emergent Dominant Party System?" MERIA Journal 15, no. 3 (October 27, 2011), http://www.gloria-center.org/2011/10/turkey%E2%80%99s-2011-elections-an…. 28 "Deadly Clashes as Turkey's Kurds Protest Kobane 'Inaction,'" AFP, October 8, 2014, http://www.france24.com/en/20141008-turkey-deadly-protests-kurds-jihadi…. 29 "Iraqi Kurdish Oil Exports Increase by 60 Percent in November," Hurriyet, November 8, 2014, http://www.hurriyetdailynews.com/iraqi-kurdish-oil-exports-increase-by-…. 30 Daniel Dombey, "Turkey's Clampdown on ISIS Bearing Fruit in Border Areas," Financial Times, September 3, 2014, http://www.ft.com/cms/s/0/910e190c-3363-11e4-9607-00144feabdc0.html#axz…. 31 Marina Ottaway and David Ottaway, "How the Kurds Got Their Way," Foreign Affairs (May/June 2014).